Updates include thinner bodies and Fishman electronics. Martin has announced updates to its Dreadnought Junior Series and Road Series, as well as a trio of models—the StreetMaster, Black Smoke and Whiskey Sunset—now available with a slope-shoulder design. The Dreadnought Junior Series is designed for players looking for big Dreadnought sound in a slightly smaller body. 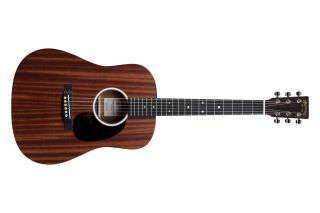 The newly updated Junior is available with a Sapele or Sitka spruce top and Sapele back and sides, with a cherry finish and a hand-rubbed neck. Shown above is the Martin DJR-10E Sapele. Every Junior model is available with or without Fishman Sonitone electronics, and all include a form-fitted nylon gig bag for easy transport. The Road Series is aimed at players looking for a full-sized, solid wood acoustic with terrific Martin tone. Newly updated in 2019, the series features a mother-of-pearl pattern in the fingerboard and rosettes (except the D-12E, which has a Style 28 rosette pattern). All models include Martin’s neck taper for added comfort as well as satin and gloss finish options and a variety of tonewoods. Road Series guitars now also feature discreet Fishman MX-T electronics with a built-in soundhole tuner that auto mutes the audio output so you can tune up any time without using a pedal. All Road Series guitars come with a Premium Soft Shell Case. The solid mahogany StreetMaster is now available in a slope-shoulder model with Golden Age relic nickel tuners, an old-style script logo and scalloped bracing. The DSS-15M StreetMaster comes with a gig bag. The DSS-17 Black Smoke slope-shoulder boasts a satin black smoke finish offset with mother-of-pearl fingerboard inlay, antique white binding, and ivoroid pickguard, as well as a solid Sitka spruce top, mahogany back and sides and rosewood fingerboard and bridge. The Dreadnought size adds depth and volume, while the slope-shoulder and modified low oval neck with high-performance taper make the DSS-17 easy and comfortable to play. The DSS-17 Whiskey Sunset Dreadnought slope-shoulder model boasts a solid Sitka spruce top and mahogany back and sides with antique white binding, as well as a rich sunburst finish. Other features include a modified low oval neck with a high-performance taper for added comfort, a rosewood fingerboard and bridge, scalloped bracing and an old-style script logo on the headstock. For more information, head over to Martinguitar.com.